Q. How can I create my own cut flower patch? HAVING A constant supply of fresh flowers for the house might seem a bit decadent, but when you’ve grown them yourself from seed they’re ever so affordable. Besides, they not only make us feel good, they also brighten up the house and make a thoughtful gift for others. Supermarket flowers might seem a cheap and cheerful option, but on closer inspection there’s a uniformity of blooms, plastic wrappings and in many cases the hundreds of air miles they’ve travelled – which can be off-putting. Harvesting blooms from your existing plants is one way to go about it, but in practice it’s awkward raiding borders to bring flowers indoors. For one thing you’ll deplete your garden display and for another, taking your secateurs to newly developed buds can feel a bit brutal. Fortunately, it’s possible to have the best of both worlds, by creating a separate flower patch just for cutting and harvesting. Having a dedicated area, no matter how small, creates a clear distinction between plants for the garden and blooms for indoors. A cut-flower garden might sound like an extravagance when space is precious and you need areas for play, eating and entertaining. Yet if you consider the design here, it’s easy to incorporate this productive area within an attractive garden space. Besides, dividing up a small garden can actually make it feel bigger by providing separate areas for different activities and preventing you from seeing the whole garden at once. 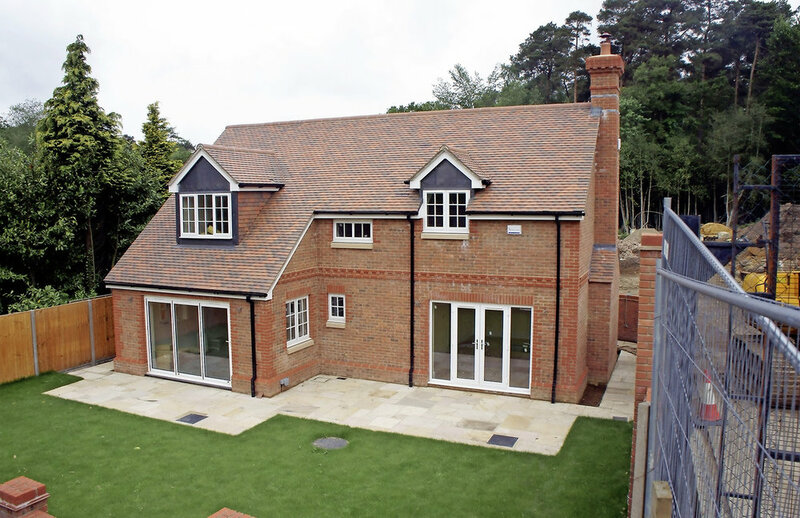 The key is to keep things simple – using the proportions of the house to guide your dividing lines and sticking to two or three key landscape features to link the areas together. 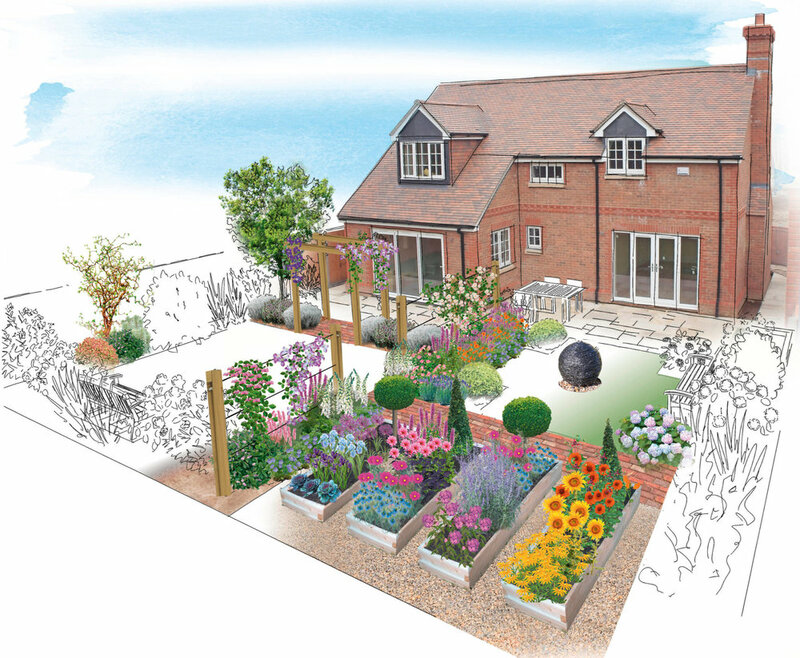 In this plot two gardens have been created in one; the first an open lawn framed by a small pergola and surrounded by mixed borders; the second a space to eat, sit and grow cut flowers. The areas are separated by a simple post and wire fence, which takes up minimal space and allows you to grow colourful climbers. Even very small gardens can accommodate various seating areas, allowing you to follow the sun’s progress and offering alternative positions from which to view the garden. Once you know how to grow your own cut flowers, you’ll never go back. They’re better-looking, more environmentally friendly and easier on your purse. Have a go and you could soon be enjoying huge bouquets of homegrown loveliness for months on end! 1. Plant seasonal stars Malus robusta ‘Red Sentinel’ has pretty white-pink blossom in spring and red fruits that last well into winter. Both look attractive in floral arrangements. 2. Repeat materials Long-lasting European oak weathers to silver and links the raised beds, pergola and fence posts together. Brick paths echo the house materials. 3. Choose trees & shrubs for shape Twisted Corylus avellana ‘Contorta’ (corkscrew hazel) branches bear yellow catkins in late winter and early spring. Stems make a shapely addition to floral displays. 4. Mix flowers, edibles & bulbs As well as cut flowers, include attractive veg such as rainbow chard and kale. For spring flowers, plant daffodil, tulip and hyacinth bulbs close together to maximise yield. Complement spring bulb arrangements with sprigs of crab apple blossom or hazel catkins. 5. Build raised beds Fill raised beds with high quality soil to make planting, weeding, staking and harvesting your crops easier – but don’t make the beds too wide! 6. Sow annuals Hardy and half-hardy annuals are a good place to start – they’re cheap and flower all summer long. Plus you can change your selection each year. 7. Use box balls for winter Position evergreen topiary at the end of each raised bed facing the house, to provide interest in winter when the annuals have finished flowering. 8. Choose flowering shrubs Hydrangeas produce excellent flowers for cutting in summer, take on beautiful autumnal tones and are perfect for drying. Also try lilacs (syringa), viburnums and peonies. 9. Create a focal point A water feature provides a decorative focal point surrounded by thyme in the gravel. This symmetrical layout creates an orderly potager look, making the space feel less like a working garden. 10. Divide your space A slender fence of oak posts and tensioned wire is clothed with clematis and sweet peas to create a ‘living screen’. This creates intrigue by preventing you from seeing the whole garden at once.